It’s the one that you’ve all been waiting for! 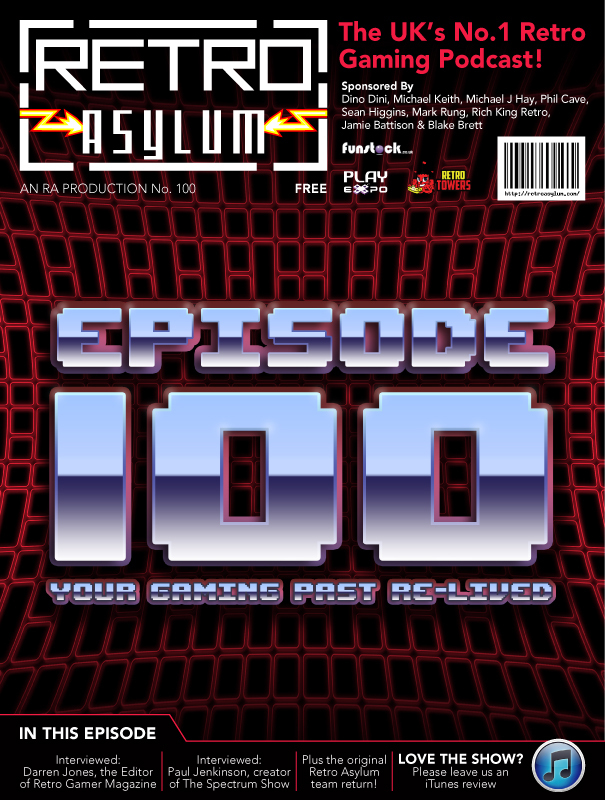 The Retro Asylum Podcast Show reaches it’s 100th episode and celebrates in style. We have exclusive interviews with the editor of Retro Gamer Magazine, Darren Jones and Paul Jenkinson, creator of YouTube hit The Spectrum Show. Dean Swain brags about his latest pick up, an un-used boxed rubber keyed ZX Spectrum whilst Paul Monaghan gets confused between Starwars & Doctor Who. We catch up with past hosts of the show plus we have an exclusive song by the legend that is Dino Dini! Massive thanks to all our wonderful sponsors and to Phil Hockaday for the superb cover artwork! http://www.playexpo.net Retured to Manchester’s EventCity for its third successive year. http://www.funstock.co.uk Home of the Dingo A330, NeoGeoX and stacks of retro gaming merchandise and usb controllers. Remember to use the code ‘asylum’ for an exclusive 5% discount against any order. http://www.retrotowers.co.uk The only place to pick up the fantastic Everdrive and retro console cables and peripherals.